Q:Why do you like/love to cook? 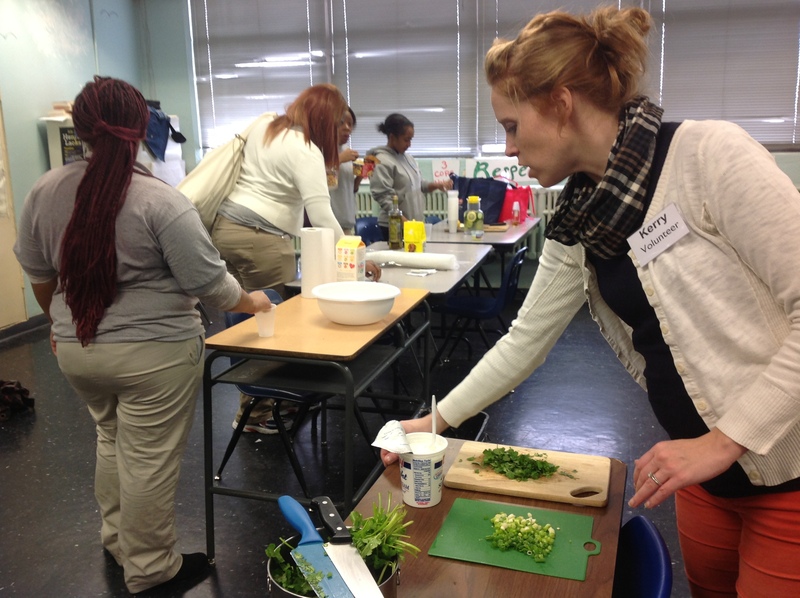 Ms. Kerry: My husband taught me to love good and healthy food. He is an organic farmer at Greens Grow Farm in Fish town, and he is always bringing home beautiful vegetables and cooking me delicious meals. I grew up eating a lot of fast meals made out of things you can buy in a box or a can at the grocery store, but he has shown me how much fun – and how much more delicious – it is to cook with fresh vegetables. Now we spend a lot of time in the kitchen together and have friends over all the time to share in our culinary creations. Q: What is your favorite food (meal or ingredient) to cook? Ms. Kerry: I absolutely love arugula. It is a small leafy green that looks a little bit like lettuce but has a peppery flavor to it. Arugula is such a versatile food, and I would eat it every day, especially if it comes fresh out of the garden. It is extremely easy to grow even in a large pot on the back patio! Ms. Tiffany: I love to cook simply. Cooking on the grill is one my favorites! I especially love to cook pizzas on the grill! Even if I don’t have fresh dough, I use brown rice tortillas or English Muffins as the base topped with my favorite ingredients and fire up the grill. An economical, satisfying meal is ready in a matter of minutes with very little clean-up required….Success! 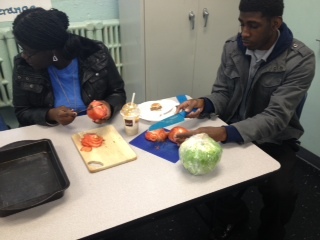 Q: What do you enjoy most about the cooking club at YouthBuild? Ms. Kerry: I love helping the students make something new that they might have never heard of before and then watching so many of them taste their creations and really enjoy them. We have made black bean burgers, pizza with potatoes on it, and lots of crazy healthy drinks, all things that made the students say “What?” at first. But in the end, after putting in a lot of work, they end up really liking the food they have produced. They take pride in what they have made in just 45 minutes, and they have such good spirits. 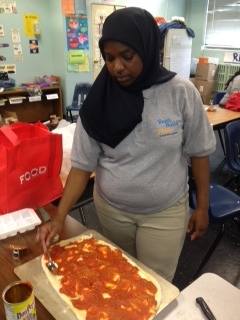 The YouthBuild cooking club students are up for anything! Ms.: Tiffany: According to the great cooking genius, Julia Child, “The only real stumbling block is fear of failure. In cooking you’ve got to have a what-the-hell attitude.” Although my home kitchen has turned into an episode of America’s Test Kitchen these days in preparing for Wednesday’s dishes and beverages (e.g. disguising vegetables in chocolate, baking chicken in yogurt, making salad dressing out of tofu, drinking the water used to cook rice, etc. ), which has been an interesting experience in itself, I most enjoy, however, interacting with the students and their skeptical but open attitudes to many of these sometimes unique dishes we prepare together. Q: What made you volunteer at YB? Ms. Kerry: I think YouthBuild is playing such a unique and valuable role for students in Philadelphia. By helping students earn their high school diplomas, begin working, or succeed in their first years of college, YouthBuild is partnering with students not simply for a year, but really for a lifetime. I am so proud of the students and the faculty at YouthBuild and love playing my little part. Ms. Tiffany: I have been volunteering at YouthBuild as a tutor, since October 20 11. As a person who wholeheartedly believes in giving back for the blessings that one has in life, volunteering is a major part of my life. I applied to volunteer at YouthBuild because I believed in their mission of not only helping low-income youth rebuild their lives but the lives of their communities. Bonus Question: What is your favorite kitchen gadget? Ms. Kerry: I just discovered this a few years ago, but I am addicted to the immersion blender. Normal blenders can be so messy and hard to clean, but an immersion blender fits neatly into a pot of boiling vegetables or a bowl of fruit or a glass of ice cream, and in seconds you have smooth and tasty soup, smoothie, or milkshake. And it is so easy to clean! I love it! Ms. Tiffany: Simply put…my favorite kitchen gadget is the wooden spoon for me to “taste” all of the dishes that are prepared…a genius invention! Interested in volunteering at YouthBuild Philly? Contact volunteer coordinator Natalie Husick to learn more about our range of volunteer opportunities, from homework help to coordinating extracurriculars. Previous Post MLK Day 2013: YouthBuild Philly Gives Longstreth Elementary an Extreme School Makeover!